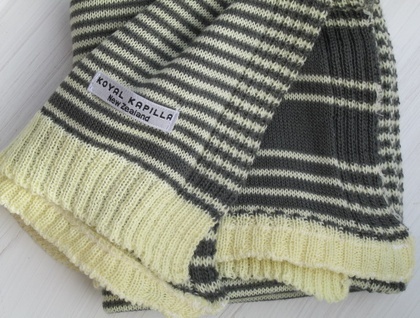 A beautiful knitted baby blanket wrap in Custard & Steel stripe. 100% fine Merino. Extremely soft and warm with a lovely handle. Nice and stretchy to wrap your wriggly baby in sunggly. Expecially designed as a small baby blanket wrap to use in small cots, bassinettes, moses baskets, buggies & prams. Great as a blanket in carseats or travelling baby bags because of its compact size. This is especially handy as shopping and will not drag on the ground. 100% fine merino is best for babies & toddlers. The fibres are much smoother which does not irratate baby's skin as some wool can. approx size: 74cmwide by 74cm length. Only 1 left.